You'll know when decision time is near. I don't have to tell you here. One day, you see motorcycles only in the background. You view some riders as irresponsible, riding noisy machines that only serve to awaken you from a sound sleep. Darn those bikers! Then suddenly on the next day, it's as if a new window has opened and all you can see through it is the motorcycle of your dreams and all you want to do is get on that machine and ride off over the next hill and never return. What a transformation! There are a lot of articles and features on this site that beginning riders will find useful. Many of these will be pointed out to you as you continue reading this article. It's easy to get overwhelmed by the amount of information available here. For the time being, just try to finish this article (all five parts) and then pursue other information later on. After you read all five parts of this article, I highly recommend that you visit our Motorcycles Forums for further advice. Our forum has been in existence for more than five years and we attract the most experienced and competent riders from around the world. We get thousands of visitors every day and often have as many as 300-500 messages posted each day. We have special topics setup for Beginners and for Safety matters. 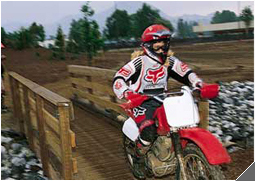 In our Motorcycles Forums, we get many people seeking help in learning to ride a motorcycle. Usually they come into the forum having been "bitten by the bug" and want advice on buying a sportbike as their first bike. We try to set them straight and turn their thinking around. They need to first take a training class offered by the Motorcycle Safety Foundation (MSF). Then they need to get a cheap bike to learn on for six months to a year. Then they can think about getting that sportbike or other model.